Nearly 10,000 unionized FCA employees could be on strike by midnight Monday. The union representing nearly 10,000 workers at three Fiat Chrysler Automobiles plants in Ontario said Monday night that it had hit "a major hurdle with FCA" during last-minute contract talks. The union made the announcement in a tweet shortly after 8 p.m. ET and later elaborated in a video statement posted to Twitter. 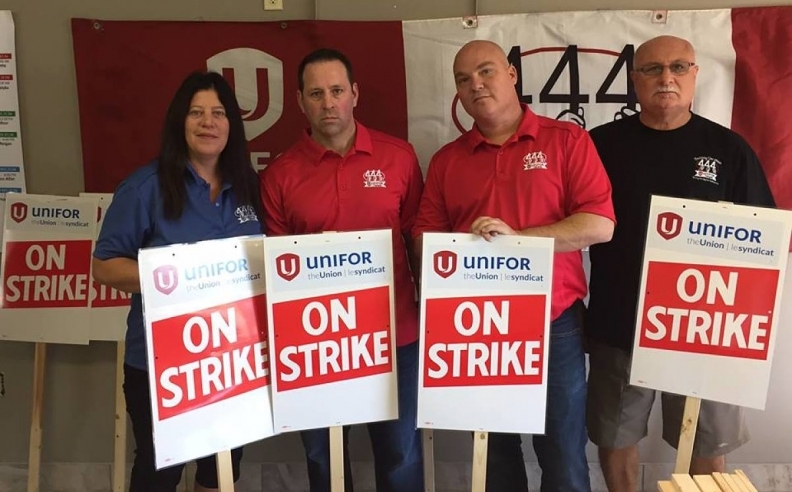 FCA made a proposal to Unifor Monday evening, union spokeswoman Denise Hammond said during the recorded video update at about 8:30 p.m.
"Our union is concerned about the direction of the employer’s proposal," she said. "There are sticking points on both the local issues and on the priorities that were established in the pattern agreement" (reached with General Motors in September). Those sticking points include investment commitments, wages, the new-hire progression grid and all other economics, Hammond said. "These outstanding issues are of grave concern to us," she said. "Make no mistake, this is a very challenging set of negotiations for our union." Canadian workers represented by Unifor are prepared to strike at 12:01 a.m. Tuesday if FCA continues to resist the pattern the union established with General Motors. FCA continues to see the collective agreement with GM as "too rich" and has yet to offer the union a deal that meets its demands for investments and higher pay, the union said earlier Monday. Hammond said the union will accept "absolutely nothing less" than what was established in the GM deal, which included hundreds of millions of dollars of investments in three GM plants, raises for legacy workers and a change to the 10-year wage grow-in for new hires. New GM hires will receive pay raises each year under the new deal, compared with a freeze on wages during the first three years under the old contract. "The pattern agreement reached with General Motors sets the foundation for Fiat Chrysler and our future negotiations with Ford," Hammond said. "There is no way we will go backwards. We will continue to fight for the pattern agreement. Unifor has scheduled another update for 10:30 p.m. Monday. Hammond's comments mirrored those of Unifor President Jerry Dias, who spoke with Automotive News late Monday morning. He struck a cautiously optimistic tone with just over 12 hours remaining until about 9,750 unionized employees at three Ontario FCA plants are set to walk off the job. “They are not amused to say the least about the changes we made to that 10-year hire-in grid,” Dias said, echoing comments he made earlier this month. FCA executives have said the new wage provisions could prove to be too costly for the company, particularly at its Windsor assembly plant, where roughly 5,000 employees build minivans, Dias said. FCA promised earlier this year that it would hire 1,200 new workers at the plant after spending about C$3.9 billion to develop the Chrysler Pacifica and to retool Windsor for its assembly. Since the Windsor assembly plant already underwent a massive retooling earlier in 2016, negotiations surrounding investment has shifted to FCA’s other two Ontario plants: the Brampton assembly plant, which builds the Chrysler 300, Dodge Charger and Dodge Challenger, and the Etobicoke casting plant, which makes aluminum die castings and pistons. The Brampton plant is in dire need of a new paint shop and Dias is concerned about the long-term viability of the Etobicoke plant, which supplies parts for the Chrysler 200 and Dodge Dart, two vehicles FCA is phasing out. “We’re having good discussions, but we need to finalize investments and economics,” Dias said. Despite the major hurdles that still need to be cleared, Dias said the union is in a better spot with FCA right now than it was at this point during GM negotiations, which went down to the final minutes. Dias said the two sides met last week with Ontario government officials to “discuss the impact of cap and trade on the auto industry.” While specifics about potential government support were not brought up, Dias said the meeting was important to show FCA that the provincial government recognizes the importance of the auto industry to its economy. “Canada has much more respect for the auto industry today than we did under the last 10 years under (former Canada Prime Minister Stephen) Harper,” Dias said, calling that important to securing investments. Unifor secured investment from GM, which will give final assembly work of the Chevrolet Sliverado to its Oshawa facility and bring some engine assembly back from Mexico to its St. Catharines engine plant. “While the master bargaining committee will continue to work hard to negotiate and reach a settlement that achieves our priorities — to secure good jobs and investment for the future — our union is preparing for strike action,” Unifor warned in a Facebook post directed to its members. Unifor Local 444 in Windsor and Local 1459 in Etobicoke finished strike preparations Friday morning so its members could enjoy the long Thanksgiving weekend. “It’s always better to be prepared,” Canada’s largest private-sector union said on its Facebook page, beneath a photo of workers making picket signs. The union has scheduled live updates at 4 p.m., 8 p.m., 10 p.m. and midnight Monday. They will be streamed using Periscope on the union’s @AutoTalks16 Twitter feed. Automotive News Canada and Automotive News will also be following the negotiations closely; readers can follow its updates at @AutoNewsCanada on Twitter, and on this Web site.